Spanning world civilizations, synthesizing dozens of political, philosophical, and religious texts and thousands of years of violent conflict, The 33 Strategies of War is a comprehensive guide to the subtle social game of everyday life informed by the most ingenious and effective military principles in war. Abundantly illustrated with examples from history, including the folly and genius of everyone from Napoleon Bonaparte to Margaret Thatcher, from Shaka the Zulu to Lord Nelson, and from Hannibal to Ulysses S. Grant, each of the thirty-three chapters outlines a strategy that will help you win life’s wars. Learn the offensive strategies that require you to maintain the initiative and negotiate from a position of strength, or the defensive strategies designed to help you respond to dangerous situations and avoid unwinnable wars. This morning we are going to learn about Jesus’ strategy for peace. As we compare his strategy with the strategy of the Pharisees, we are going to discover that love can sometimes make enemies. 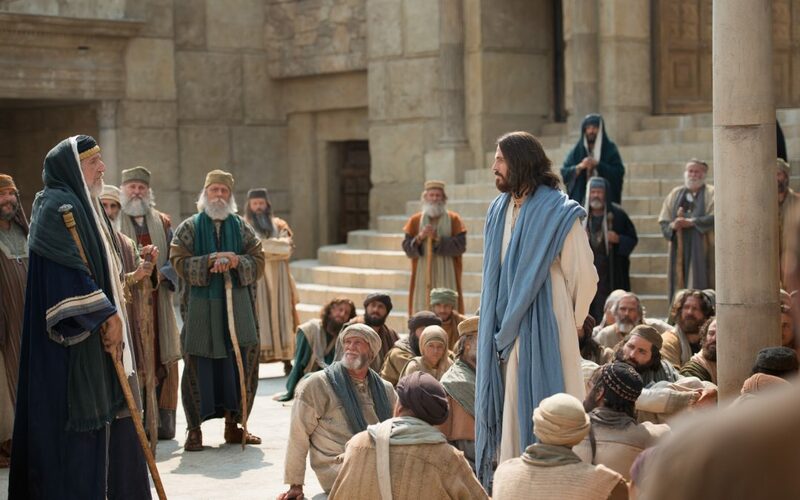 What was the strategy of the Pharisees? They were close enough to the disciples to see them helping themselves to some ears of corn. Luke 6 adds, “The Pharisees and the teachers of the law were looking for a reason to accuse Jesus, so they watched him closely.” (Luke 6:7). This is what Greener calls Strategy 11 “Know your enemy”. Get close enough to know their weaknesses. Today there are plenty of pharisees who troll via the internet. They stalked his disciples. They asked, “Why are you doing what is unlawful…” (Mark 2:24). They were seeking to intimidate Jesus and his disciples, by accusing him of law breaking. This is Strategy 10 in Greener’s book – “Create a threatening presence – deterring strategies”. They criticised his behaviour. “Why are you doing what is unlawful on the Sabbath?” This is Strategy 25, the “Righteous Strategy” – claiming the moral high ground and questioning your opponent’s motives. “I am sending you out as sheep among wolves. Therefore be as shrewd as snakes and innocent as doves” (Matthew 10:16). He didn’t say become sheep in wolves clothing or worse, wolves in sheep’s clothing. That is why you probably won’t find the strategies Jesus used to overcome evil in Robert Greene’s The 33 Strategies of War. So how did Jesus deal with opposition? And how does he want us to deal with opposition? The Pharisees were professional theologians – like judges today. But Jesus questioned whether they had even read the scriptures. “You question is a very elementary one, and one that reveals a very poor grasp of the Scriptures.” The story Jesus refers to is recorded in 1 Samuel 21:1-6. Each week twelve consecrated loaves of bread, representing the twelve tribes of Israel, would be placed on a table in the house of God, the tabernacle. At the end of the week, the old loaves were replaced and eaten by the priests (Leviticus 24:9). On one occasion, the high priest gave this consecrated bread to David and his men to eat as they were hungry and fleeing from Saul. David’s need for food was more important than the priestly regulations. By comparing himself and his disciples to David and his men, Jesus was saying, in effect, “If you condemn me, you must also condemn David.” By referring to himself as “Lord of the Sabbath”, Jesus was claiming authority over them and redefining the Sabbath as a day of refreshment, worship, and healing. Jesus countered their hypocrisy with Scripture. Brothers and sisters, the Scriptures are to be our only weapon, not your pen or email, not our blog or tongue, and least of all the back of your hand. The Scriptures are the sword of the Spirit. The Word of God in the hands of the Spirit of God, will cut through every human argument, every false premise, every deceitful scheme. What is our part in this? The Apostle Paul instructs Timothy, “correctly handle the word of truth” (2 Timothy 2:15). Get to know the Scriptures – read it every day – ask God to help you understand and apply it. Jesus countered their hypocrisy with Scripture. Someone has defined tradition as “the living faith of those now dead,” whereas traditionalism is “the dead faith of those now living.” Jesus’ critics were locked into traditionalism. They had long since forgotten the reason behind the Sabbath observance which was to honour the Lord. Instead, they focused solely on the mindless rule keeping that is the empty soul of legalism. Never let your traditions become traditionalism. “People become like the Pharisees when they use religion to judge and condemn others instead of reaching out to them with loving concern and the truth of the gospel.” How does Jesus respond? He takes the initiative. He stands up to his opponents. But he will not fight on their hypocritical terms or use their methods. Instead he turns the tables on them. Strategically, he takes the controversy to them. Jesus appeals to their logic as well as their conscience, as he did on a previous occasion when he said, “Which is easier: to say, ‘Your sins are forgiven,’ or to say, ‘Get up and walk’?” (Mark 2:9). This is because Jesus wanted a change of heart in his opponents. He was not trying to win an argument. How ironic that Jesus was seeking to heal while they were plotting to kill. It must have been obvious to everyone in the Synagogue who was guilty of breaking the Sabbath. Jesus dealt with the causes not the symptoms. Knowing what they were thinking he spoke, he was proactive. Mark tells us “But they remained silent.” (Mark 3:4). They were unwilling to repent, unwilling to concede to his logic, unwilling to recognise Jesus power, unwilling to submit to his authority. Jesus countered their hypocrisy with Scripture. Jesus challenged their motives with substance. I think this is the only time we see Jesus perform a miracle while angry. He is angry and in deep distress. But how does he channel his deep anger and distress? He looks around at them in anger but says to the man in compassion “Stretch out your hand.” As the man did so, his hand was miraculously restored. God created the world with the power of his spoken word. “Do not repay anyone evil for evil… do not take revenge… Do not be overcome by evil, but overcome evil with good.” (Romans 12:17). Jesus said “I have come to seek and save the lost” and he would not allow those who opposed him to side track him from his purposes, or to deflect him from his mission. He doesn’t back down. He isn’t intimidated. And neither must we be. One of the principles I live by is this – I do not intimidate and I will not be intimidated. . Opposition is however, an unavoidable consequence of following Jesus. The apostle Paul adds, “In fact, everyone who wants to live a godly life in Christ Jesus will be persecuted,” (2 Timothy 3:12). So you have a choice to make. You can either follow Robert Greene’s, The 33 Strategies of War or follow Jesus’s strategy for peace. But remember you cannot serve both masters. Like Jesus, you have a mission to fulfill, regardless of your circumstances, irrespective of the opposition – to follow Jesus. What ever keeps you from your God-given purposes is your enemy. What are your purposes? You were planned for God’s pleasure, so spend time in each day with our Lord Jesus Christ, reading God’s Word and praying. You were formed for God’s family, so meet with God’s people every Sunday to build one another up. You were created to become like Jesus. You were shaped for serving God in and through his Church. You were made for a mission, like Jesus to be peacemakers. What was Jesus’ strategy for peace? Jesus countered hypocrisy with Scripture. Jesus challenged motives with substance. Jesus channelled his passion into saving. How should model our lives on him? Don’t let other people impose their values, their priorities or their traditions on you. Deal with the causes not the symptoms and seek peace. Don’t let anyone deter you, or anything to distract you from fulfilling God’s purposes – to know Jesus and make Jesus known. In the week ahead, when you face opposition, as you most certainly will, realise that loving other will make you enemies, however hard you try and avoid it. And finally, remember that ultimately its not a question of which strategy you follow but whose strategy. This entry was posted in Bible, Peacemaker, Sermons, Theology on June 3, 2018 by Stephen Sizer.